Motion Imaging Corporation (MIC) is headquartered in Minnesota, and the company must be thrilled that the University of Minnesota has built a state-of-the-art equine sports medicine center right in the neighborhood. This week, MIC gave us a peek at their motion capture analysis system in use at the center. What you see here are a few strides of a horse on a treadmill. MIC also makes a system called Equine Gait Trax that captures motion to aid in the evaluation and assessment of gait in horses. The high speed ratio of the camera allows great detail to be seen when the speed is slowed down. Next month, the University of Minnesota will host the 5th International Symposium on Rehabilitation and Physical Therapy in Veterinary Medicine in Minneapolis. Speakers include Dr. Hilary Clayton. Sometimes, it's a good idea to turn off the computer and get out a pen. Rummage around until you find a card or go buy a post card or find a sheet of letterhead or nab a placemat from the diner where you're going to have lunch today. And write a note to a friend. Just say hello and tell your old friend what you're doing, where you are, even what the weather's like in your part of the world. In the world of one good farrier friend right now, it might be a great diversion to hear from old friends. He'd do it for you, and probably has. The Steward Clog is less of a product than a concept. Dr Michael Steward in Oklahoma has created a unique, affordable and simple system for helping foundered horses. We hear about good results with the system from vets and farriers all over the world. The idea of a pivot point rather than a supportive platform is a leap of faith that is difficult for many to make. And we usually don't make those types of leaps until we've tried everything else. If there is one thing that the last ten years of experimental farriery has proven it is that removing resistance can have as therapeutic an effect as adding stability, which was the old-school 1990s way approach to laminitis (and still works for a lot of professionals). People call here and ask "Where can we buy those Steward clogs?" The answer is the whole point: you can't. Dr Steward has nothing to sell. The Steward clog is an idea, a system that you can probably make yourself out of scrap materials found in any barn or garage. The "system" is actually just a block of wood. Period. You use screws or glue to attach it to the foot. Period. Dr Steward says that the bottom of the clog needs to mirror the shape of the coffin bone (P-3) and be correctly positioned beneath the bone. Period. It's been five years now since Dr Steward presented the concept at the 2003 AAEP Convention in New Orleans and in that time, a lot of clever people have put their minds to ingenious ways to use or attach the clog. As long as you keep it simple, it seems to be a viable option for lots of horses, and sometimes the only option for people without the budgets for designer heartbars and rainbow "packages" of impression material. EDSS, makers of the Natural Balance shoe, originally introduced me to the Steward Clog, and then they went one step further and started "manufacturing" a plastic clog. Now our British friend David Nicholls AWCF has gone a step further. Perhaps some owners would balk at allowing a farrier to twist screws into a horse's foot, or perhaps the sole needs to be cleansed or medicated. In that case, David's clog:clog solution was to screw the plastic EDSS version of the Steward Clog to a Dallmer clog, which is sort of an exterior-strap plastic hoof boot. No doubt, the clog could probably be attached to any hoof boot, if you remember that the placement of the clog is critical. Normally, the clog is a 24/7 sort of a regimen, not something that is put on or taken off, but Dr Steward would have great advice there, I'm sure. 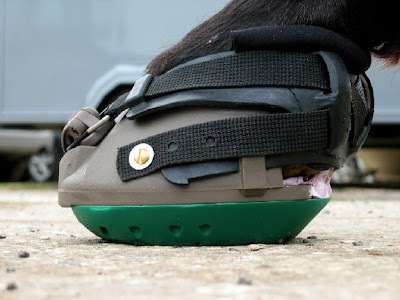 Strapping on a laminitis support device gives you a test phase that allows you to go to Plan B if the horse doesn't like it. 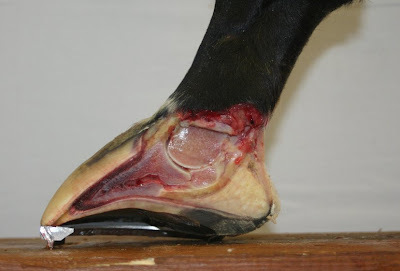 David writes, "This equine patient did not respond well to wearing glue on heart bar shoes and the veterinarian cut a hole in the sole of this foot. He wanted a removable system so he could continue to treat this foot.The pink EDSS Impression Material is placed into the least painful areas of the rear of the foot. The other foot had a clog nailed on. Once the sole issues had been dealt with, I removed the Dr Steward EDSS clog from the Dallmer clog (too many clogs here!) and nailed it back onto the now-healed foot. The equine patient never looked back and has returned to its previous job as a riding horse. This case was a referral so once it was sound and shod I did not see it again." TO LEARN MORE, read "How to Construct and Apply Atraumatic Therapeutic Shoes to Treat Acute or Chronic Laminitis in the Horse" by M. L. Steward in Proceedings of the 49th Annual Convention of the American Association of Equine Practitioners, 2003 or read the "Going Dutch" article by Holly Clanahan about clogs used by Dr Steward on foundered Quarter horses in the January 2008 edition of America's Horse, published by the AQHA. 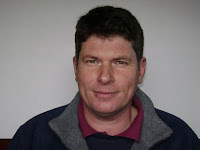 Lameness specialist Ian Hughes of Wales is farrier at the Ashbrook Equine Hospital in Cheshire, England, as well as the farrier and lecturer on farriery at the University of Liverpool's equine hospital. It wasn't easy for him to take nine weeks out of his life and head to Hong Kong...but he's now on his way! Ian left on a long, long flight today and by tomorrow will be setting up the forge and shoeing clinic where he will be working as official farrier for both the Olympics and Paralympics. British farrier Kelvin Lymer and the Hong Kong Jockey Club's Greg Murray will join Ian during the Games, but Ian will also be staying on to be the farrier for the Paralympics in September. The horses start arriving in Hong Kong later this week, and Ian wants to make sure that he has the forge up and operating in case he is needed. While some countries send a farrier, many do not, so Ian should have plenty to do, with 240 horses expected for the Games and 78 for the Paralympics. Hong Kong has been getting ready for Ian, whose vast orders for supplies were shipped months ago from Europe. Ian was the farrier for the "Test Event" in Hong Kong last summer, so he has worked in the new forge. 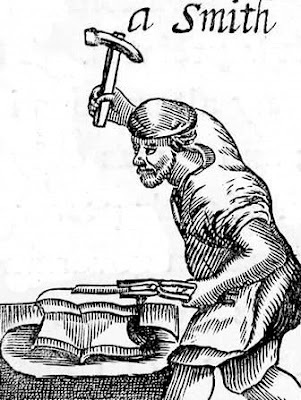 He has done some work on redesigning things, and expects that the forge will have air-conditioning on the shoeing floor this year, although not in the forge itself. Getting on the plane for Hong Kong means a huge logistics task for Ian--not in relation to the Games, but in relation to his business at home. In addition to serving the vet hospital in Cheshire and the University's hospital, Ian has a regular client list based all over the countryside. "Trying to organise your business and livelihood to withstand the main person to go away for nine weeks with no input at all has proven as difficult as organising the Farriery Department (for the Olympics)," Ian said yesterday in an email. "At least with Hong Kong you are only dealing with half a dozen people and their ideas and thoughts," he went on. "With my business, we literally have hundreds of clients all concerned that their horse or pony will continue to get the best attention." Security is very high in Hong Kong and Ian must be careful what he says by email and telephone, but you should be hearing from him and the other farriers from time to time over the next few months via the Hoof Blog. Ian is a specialist in lameness and does a lot of research, as well. He was a co-author of a paper published recently in the Equine Veterinary Journal on (hoof) wall strip surgery. Congratulations to Ian and all the farriers who are making the trip to Hong Kong. Watch for more news from them as it comes in! Please understand that professional standards prevent them for discussing the horses they work on while the Games are on. Likewise, Ian is not open about the brand names of products that he ordered to be shipped over. The British equine veterinary practice of Greenwood Ellis & Partners is currently building a unique center of veterinary services just outside Newmarket, the Thoroughbred training capital in Suffolk. The practice claims that its new Newmarket Equine Hospital (NEH) will be "the largest and most modern private equine hospital in Europe ". The hospital will gather all specialities of the equine veterinary profession in a purpose-built, state-of-the-art facility. Greenwood Ellis & Partners have been based at Reynolds House on Newmarket High Street since the early 1900s and have built up a world-class reputation for dedicated and high-quality equine veterinary care. The practice intends to occupy the new facility and expand within it by autumn of this year. Located by the landmark of the "stallion statue roundabout" near the July racecourse, NEH will be at the center of the racing headquarters with the two racecourses, the training grounds, racing stables and stud farms all within close proximity and with direct access to the local major highways. As part of the expansion of the practice, a new website has been launched, using the services of a consortium of talented people in and around the town, led by the Blue Lizard group. The new website outlines the current and future services and technologies. The website features a hospital development blog, together with a photo gallery, to describe the progress of the new hospital as it progresses from a green field to its current state of near completion. Other sections outline employment opportunities, such as the internship program and veterinary positions available at NEH, as well as work experience and non-veterinary vacancies. A decision had been due in California last week about a proposed rule change that would allow Thoroughbred horses to race barefoot at the state’s tracks, all of which have recently been converted to artificial surfaces. At yesterday’s meeting at Del Mar Racetrack near San Diego, the CHRB sent two the regulatory amendment back out for 15-day public notice with minor changes to the texts. The Board indicated it would suspend the portion of the rule that requires horses to be shod, as long as it is publicly noted in the official program. The memo from the CHRB indicated that a public hearing will be held. Vice Chairman Richard Harris noted that while this proposal to allow horses to race unshod has been around for some time. He said that the installation of synthetic surfaces in California has helped push it forward because some horses appear to be training better without shoes on the new surfaces. The amendment would allow a horse to race unshod if the trainer feels the horse might run better without shoes. Any changes would be noted on the official program. Dr. Diane Isbell, one of the CHRB’s official veterinarians, provided some details during a special meeting on February 20 that focused on synthetic surfaces. Dr. Isbell was among seven veterinarians on a panel that discussed the safety of synthetic surfaces in terms of injuries to horses. Dr. Isbell did not give a reference for that research. If the regulation change passes, the official program will note when any horse adds or removes shoes. 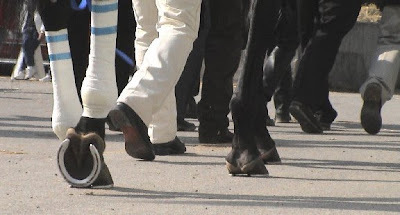 To date, the CHRB has heard no testimony in opposition to allowing horses to race unshod. Way, Suite 300. Sacramento, CA 95825. For additional details, he can be reached at (916) 263- 6397 or Fax (916) 263-6022 or e-mail (harolda@chrb.ca.gov). Most states and racing jurisdictions require horses to be shod. Kentucky Derby and Preakness winner Big Brown recently spent a few weeks barefoot while in light exercise at Aqueduct, but has since had glue-on shoes re-applied, according to hoof repair consultant Ian McKinlay. Standardbred farrier Conny Svensson recalled in an article recently that he pulled the shoes on champion Moni Maker in 2000 when she she raced in France. She went out and trotted the fastest mile in European history. A few weeks later, the trainer gambled and tried it again when she was racing in Italy. She broke stride and was eliminated. Artificial arena surfaces have been detrimental to the hooves of some unshod sport horses, although ill effects of racing surfaces have not been reported, perhaps because horses in most states are required to be shod. Farrier Bob Pethick in New Jersey documented the deterioration of hoof wall thickness in a barefoot warmblood when it was moved to a new stable with a more abrasive indoor arena surface. The case was documented in Hoofcare and Lameness Journal, issue #78. Click here to read the article online. In other news, California added horsewoman and celebrity Bo Derek to the Board, banned the four major steroids from use on racehorses in the state, and unanimously adopted a regulatory amendment prohibiting posterior digital neurectomies, or “heel nerving.” Any horse that undergoes such a procedure after October 1, 2008, will be prohibited from racing. This prohibition was opposed by the Thoroughbred Owners of California, which believes California should wait for a national policy. Please attend any or all of these casual, summer-style educational events. All events are on Tuesdays. Admission is free. Tuesday, July 29 (evening) RIDE ON Exhibit Preview at National Museum of Racing with speakers Donald Walsh DVM (laminitis) and Allie Hayes (anatomical aftermath of hoof and leg injury), who are featured in this new museum exhibit on horse health, lameness, and laminitis. Comments by trainer Michael Dickinson and farrier Michael Wildenstein; meet exhibit curator Beth Shaffer. The Parting Glass Pub will still be open for dinner after this event. 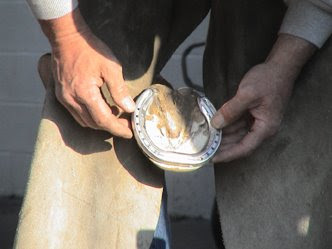 Tuesday August 5 (evening) RACETRACK Shoeing at the Parting Glass with Grayson Jockey Club Welfare and Safety Summit Shoeing Committee to share new research, view new high-tech videos of different shoes on different surfaces, and discuss toe grab and shoeing rules. "Mad Genius" trainer Michael Dickinson, developer of Tapeta surfaces, will also speak. Tuesday August 12 at the National Museum of Racing (afteroon) sponsored by LIFE DATA LABS and at the Parting Glass (evening). Racing surfaces and hoof cracks, wall separations, with racetrack surface researcher Dr Mick Peterson, Thoroughbred hoof repair specialist Ian McKinlay, and Swedish Standardbred shoeing specialist Conny Svensson. Tuesday August 19 (evening) at the Parting Glass; program led by Michael Wildenstein FWCF (Hons), Cornell University, plus special guests to end the series. The Parting Glass is located at 40 Lake Avenue (one block off Broadway) in Saratoga Springs. Dinner is available at the Parting Glass at a reasonable cost. The National Museum of Racing is on Union Avenue, opposite the main entrance to the track. Out of town? Call the Comfort Inn and ask for the "Hoofcare" special rate: (518) 587-6244. The nearest airport is Albany, New York. For more information: please don't call the Museum or the Parting Glass! Visit http://www.hoofcare.blogspot.com for updates and announcements. Speakers and programs subject to cancellation or change without notice. Presented with the help of CCE Equine and Equilite, Maker of Sore No More Liniment. Special thanks to Freida Garrison and Jim Santore and the Parting Glass Pub. Sponsorship opportunities available for some events, please inquire. Unless you are embedded in the world of horseshoes, you might not know what a toe grab is. It is cleat, basically, that protrudes from the toe area of a horse shoe. Many people believe that horses need something to push off from, particularly when leaving the gate, and the toe grab was designed to do that. Toe grabs come in many lengths. The most extreme are Louisiana and Quarter horse toe grabs. Most racehorses wear regular or low-toe shoes if they have toe grabs, and most of them are on the hind feet. Shoes are available with traction devices on the heels and they can also be added to the shoes if the track is slick or wet. Calks can also be forged or the tip of the heel of a race plate can be bent at an angle. It is often said that the United States is the only country that allows toe grabs, and that is untrue. First of all, most racing around the world is on grass courses, especially Europe and Australia. Horsemen and horseshoers in those country are pretty horrified by the idea of toe grabs, but they also do not race on dirt. Dave Erb of Victory Racing Plates shared with me a good rule of thumb. I asked him what countries allowed toe grabs. He said, "Anyplace with the word 'America' in it: North America, South America, Central America." I think that the shoe manufacturers are a wealth of information about what works and what doesn't. I hope they will get involved in these discussions about shoeing rule changes and join us in Saratoga next month. 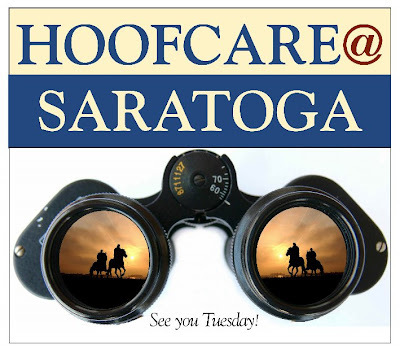 Note: "Hoofcare@Saratoga" will host two sessions specifically on racehorse shoes in the news. On August 5th, members of the Grayson Jockey Club Welfare and Safety of the Racehorse Summit's Shoeing Committee will present new research and answer questions from 7 p.m. on at the Parting Pub in Saratoga Springs, NY. On August 12, a double session at both the National Museum of Racing (in the afternoon) and the Parting Glass (in the evening) will cover racing surfaces and hoof injuries. What's worse, the toe grab or the long toe? Some people believe that this distorted hoof shape is typical of racehorses in the United States (and elsewhere). On the other hand, in New York, people tsk-tsk that the feet are too short. Does the toe grab have the same effect on the coffin joint when the foot is short? This photo is from the research conducted by Kentucky farrier Mitch Taylor. He put a leg in a vice and applied pressure. The point of this photo is to show the affect of the toe grab when the foot is on a hard surface, pushing the forces back but, more importantly, compressing the joint space in the coffin joint, between P2 and P3. Presumably, galloping at speed would have a similar effect. Mitch has put a lot of work into these studies; he also has been making high speed video recordings of horses wearing different shoes and galloping over different track surfaces. Mitch's research is part of his work with the Grayson Jockey Club Foundation's Welfare and Safety of the Racehorse Summit. I couldn't believe my eyes when I saw a press release tonight from the Keeneland.com website for the Keeneland Racecourse and Turfway Park, two Thoroughbred tracks in Kentucky that both use Polytrack surfaces. As background, the racing commission in Kentucky announced earlier this week that it would recommend that the legislative committee in the state government endorse its decision to ban toe grabs and other traction adaptations on front shoes at all tracks in the state. The verbiage was based on a recommended model rule from the new Safety Comittee of the Grayson Jockey Club Foundation. The next day, Penn National Gaming, a conglomerate of tracks that includes Charles Town in West Virginia and Penn National in Pennsylvania, announced that they would also ban front grabs and traction devices. Both tracks are closed to racing for the summer, and will reopen in September for fall meets, but presumably horses are in training and would be affected. Up to this point, hind shoes had never been in any suggested rules. Yes, horseshoers have been voicing their opinions. While many are not particularly fans of toe grabs, especially on front feet, they fear that any rule that bans this and that opens the door for them and those. For instance, notice that the Keeneland/Turfway rule does not mention bends. 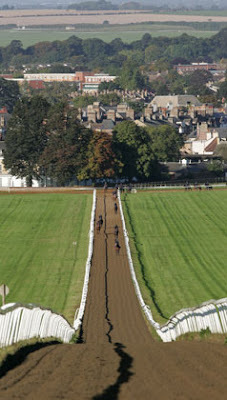 Bends may not help a horse on Polytrack much, but neither would the other adaptations listed. Horseshoers are concerned about traction and the safety of the horses both getting out of the gate and around the turns. One shoer last night suggested that getting rid of toe grabs would make the most lucrative job on the racetrack that of the chiropractor, and that gluteal muscle injuries would be the most likely manifestation if hind toe grabs were ever removed. Maybe we'd better start taking reservations for seats at our "Hoofcare@Saratoga" August 5th forum on racetrack shoeing in Saratoga Springs. The August 12th "Hoofcare@Saratoga" forum is on hoof injuries, especially quarter cracks, and we have added Dr. Mick Peterson from the University of Maine as a speaker, along with Ian McKinlay of Big Brown fame and Conny Svensson of Moni Maker (Standardbred) fame. Dr Peterson is the country's leading researcher on racetrack surfaces and how the horse's hoof hits them. So far, California, Florida and New York tracks and racing jurisdictions have not weighed in on this issue. Last year, California banned excessive toe grabs over 4 mm high on front shoes. Mitch Taylor has been shoeing and re-shoeing horses at the Keeneland Racecourse in Lexington, Kentucky as part of the Grayson Jockey Club Foundation's Welfare and Safety Summit's Shoeing Committee's mission to understand how different shoes affect a horse's gait on different surfaces. Both the Keeneland training and main tracks have been converted to Polytrack, a surface that the track promotes as safer than traditional dirt. Mitch will present new research from these studies on August 5th at the Hoofcare@Saratoga event in Saratoga Springs, New York. This photo is a still from the high speed video presentation by Mitch presented at the Fourth International Equine Conference on Laminitis and Diseases of the Foot in November 2007. Penn National Gaming, Inc., the second largest owner of pari-mutuel racing facilities in North America, today announced the implementation of several initiatives intended to ensure the continued health and safety of equine participants at its racetracks. These initiatives include limiting the height of toe grabs on front shoes worn by race horses, endorsing rules for new riding crops for Thoroughbred jockeys, and recommending, at a minimum, the adoption of the Association of Racing Commissioners International (ARCI) model rule regarding Androgenic Anabolic Steroids. The initiatives follow the recently issued recommendations of The Jockey Club’s Thoroughbred Safety Committee. Founded in 1894, the Jockey Club is dedicated to the improvement of Thoroughbred breeding and racing and is the breed registry for North American Thoroughbreds. Penn National Gaming owns and operates gaming and racing facilities with a focus on slot machine entertainment. The Company presently operates nineteen facilities in fifteen jurisdictions, including Colorado, Florida, Illinois, Indiana, Iowa, Louisiana, Maine, Mississippi, Missouri, New Jersey, New Mexico, Ohio, Pennsylvania, West Virginia, and Ontario. Penn National is the second largest owner of pari-mutuel facilities in North America and conducts over 1,000 dates of live racing annually. Total wagering at its pari-mutuel facilities on live and simulcast racing totaled nearly $850 million in 2007. From what I can tell, this ban on toe grabs would be what is called a "house rule". Individual states have rules regarding shoes; Kentucky banned toe grabs on a statewide basis this week. However, apparently an individual track or even a meet, can have separate rules, if I understand the process correctly. The New York Racing Association, or "NYRA", is an example of an affiliated group of tracks--Aqueduct, Belmont and Saratoga--but a NYRA rule might not apply at Finger Lake Race Track or Vernon Downs in western New York state, for instance, if I understand correctly. Therefore, this rule would affect only horses racing and training at tracks governed by Penn National Gaming. For instance, it would not affect Presque Isle in Pennsylvania or Mountaineer Park in West Virginia, which are not part of the Penn National group, as far as I know. Click here to read the Hoof Blog's announcement about the recent Kentucky decision to change its shoeing rules. Click here to read the Jockey Club's recommendation for a rule change. Go to most recent story on the Hoof Blog and view all news. Lisa Underwood, executive director of the Kentucky Horse Racing Commission, confirmed tonight that her agency today announced that they would adopt the model rule proposed by the Grayson Jockey Club Foundation's Thoroughbred Safety Committee and significantly add to the language describing how horses may be shod for racing and training on all types of racing surfaces in the Commonwealth of Kentucky. On June 17, the Committee issued a model rule suggestion to the individual state racing jurisdictions around the country. 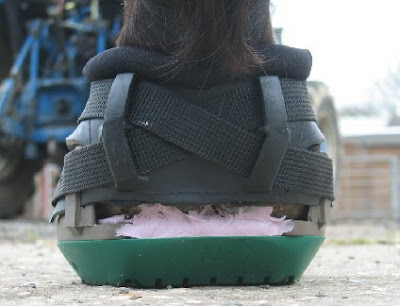 1) An immediate ban on toe grabs other than 2-millimeter wear plates, turn downs, jar caulks, stickers and any other traction devices worn on the front shoes of Thoroughbred horses while racing or training on all racing surfaces. 2) The Association of Racing Commissioners’ International (RCI) and all North American racing authorities to implement this ban by rule as soon as possible, but no later than December 31, 2008, and for all racetracks to consider immediately implementing this ban by “house rule” in the interim. We all know that most of those adaptations are worn on hind shoes, but this does clarify the previous model rule change suggestion, which called for a ban on toe grabs higher than four millimeters. The new rule sounds like it would limit horses to wearing flat plates in front. Hoofcare and Lameness will host a forum on the topic of racehorse shoeing regulations on Tuesday, August 5, 2008 as part of our "Hoofcare@Saratoga" event series. Come and meet Bill Casner of Winstar Farms, chairman of the Grayson Jockey club's Welfare and Safety Summit's Shoeing Committee, and hear farrier instructor Mitch Taylor, who will present new research conducted by the Welfare and Safety Summit (WSS), and get real-world insights from Kentucky Thoroughbred shoer Steve Norman. Introductory lecture about artificial surfaces will be by the "mad genius" trainer, Michael Dickinson of Fair Hill, Maryland and Tapeta. Other speakers and participants will be announced. All in the horseshoeing and racing worlds are welcome to attend...and it might be a good idea, given these new rule changes. Watch this blog for more news about this important event, or send an email to Saratoga@hoofcare.com to get on our email notification list for the Hoofcare@Saratoga series. Photos for this post courtesy of Dan Burke of FPD, distributors of Kerckhaert shoes in the USA. Thank you! 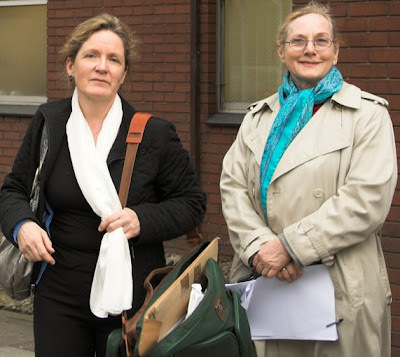 Joanne Kowalski (left) with Hiltrud Strasser DVM outside a British courthouse during Ms. Kowalski's first trial for cruelty by means of radically trimming the hooves of a foundered pony. An appeals court lessened charges against the trimmer. Amazing news from England today. A hoof trimmer who worked on a foundered pony following instructions from German veterinarian Hiltrud Strasser has had her conviction and sentence softened considerably. Josephine Kowalski had been convicted of cruelty and of intentionally not seeking veterinary care that might have spared the pony some pain. She had been charged with 100 hours of community service and 10,000 pounds (about $20,000) in restitution. Kowalski appealed and, after serving 30 hours of community service, was cleared of charges in a British appeals court, although she still appears to have been reprimanded for not seeking a veterinarian to medicate the pony. This story is painful to read, but if you would like to, here's a link to the British newspaper. Is the Biggest Horse Around Here the Biggest in the World? To make it into the Guinness Book of World Records, a Belgian pulling horse named Tex had to have his shoes pulled. Farrier Rick Sharp pulled the shoes for an official measuring ceremony recently. Guinness requires that the horse be measured both with and without shoes. According to the Concord Monitor newspaper, the six-year-old Belgian stands about 7 feet, 6 inches from hoof to head and weighs 2,450 pounds. This hoof is ten inches across, according to the article. Tex is trying to tower over Radar, a Belgian in Texas who currently holds the Guinness honors, according to the newspaper. It's not clear whether Guinness goes by the overall height of the horse or the actual hands at the withers. His owners are hoping he makes 20 hands. Shire horses in Australia and England are also trying to claim the title. You can see why Guinness requires the shoes to be pulled before a horse is measured. This is not Tex, but another very large Belgian pulling horse that I saw worked on at Rood and Riddle Equine Hospital in Lexington, Kentucky a few years ago. Tex is probably shod in a similar way for the competition season. This horse had laminitis, but farrier Aaron Gygax managed to get him sound enough to keep pulling. 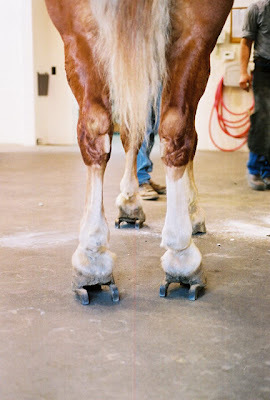 This horse was shod in a very low-tech way for a high-tech place like Rood and Riddle: Aaron made the horse's new shoes. In this photo, you see his old shoes. I think he could climb telephone poles, too. You are invited to a special preview night for professionals to RIDE ON! Research Update and Field Practice Notes by Donald Walsh DVM of the Animal Health Foundation. Dr Walsh will survey current research accomplishments and treatment innovations from research funded by AHF at the Australian Equine Laminitis Research Unit and other research centers. Dr. Walsh's work on behalf of laminitis research is featured in the RideOn! exhibit. Professional anatomical specimen creator Allie Hayes of HorseScience and Horsescience.com will compare and contrast Thoroughbred feet with other breeds and share a haunting collection of the preserved feet and limbs of Thoroughbreds, including breakdown victims and laminitis sufferers. Allie's educational anatomical specimen are featured in the RideOn! exhibit. Remarks and short presentations by Thoroughbred trainer and footing expert Michael Dickinson and Cornell vet school farrier professor Michael Wildenstein FWCF (Hons). Doors open for a private viewing of RIDE ON! The Museum's new exhibit on advancements in the health and soundness of racehorses. Enjoy the exhibit and share your observations and experiences with our special guest, curator of collections Beth Sheffer of the National Museum of Racing and Hall of Fame. The new exhibit focuses on colic, leg fractures, breakdowns, hoof and limb anatomy and laminitis. Artifacts in the exhibit include shoes, braces, and hoof-related equipment handcrafted and provided or loaned by contributors and editors of Hoofcare and Lameness Journal. The main part of the Museum will be closed on Tuesday night but will be open on Tuesday afternoon and on Wednesday. Tuesday night attendees will be able to see the Hall of Fame and the Ride On! exhibit. Hoofcare and Lameness Journal will host four Tuesday events in Saratoga Springs during the 2008 summer race meet, beginning on Tuesday, July 29 at the Museum. Confirmed speakers for August 5, 12, and 19 include (in alphabetical order) Bill Casner, Michael Dickinson, Ian McKinlay, Steve Norman, Mick Peterson, Conny Svensson, Mitch Taylor, Michael Wildenstein and others to be announced. The series is made possible by generous support from LIFE DATA LABS, makers of Farriers Formula, as well as the National Museum of Racing, the Grayson Jockey Club Foundation, the Animal Health Foundation and the Van Lennep Equestrian Center at Skidmore College. The series is presented with the help of CCE Equine and Equilite, maker of Sore No More liniment products. Hoofcare@Saratoga would not happen without two special friends of the hoof in Saratoga, Frieda Garrison and Jim Santore, and our friends at the wonderful Parting Irish Pub. Join us for one program, or come for them all. Events are free, thanks to our generous sponsors. HOTEL ACCOMMODATIONS: For the July 29 event only, hotel rooms are available at the spectacular new Hampton Inn on Lake Avenue in downtown Saratoga (directly opposite the Parting Glass Pub) for $159 per night. Call for reservations: 518 584 2100. A special rate of $159 per night is available for the entire Hoofcare@Saratoga series at the Comfort Inn, conveniently located at Exit 15 on the edge of town. Call 518 587 6244. You must request the "Hoofcare" rate. $159 is a very reasonable price during the race meet. Saratoga Springs is a few hours due north of New York City, and 30 or so minutes north of Albany, where the closest major airport is located. Home of the longest-running Thoroughbred racing season in America, the town is also alive with major Standardbred racing, polo, and all sorts of pleasure and sport horse activities. Reservations are not necessary but an RSVP would be appreciated for planning purposes at the Museum. Please email saratoga@hoofcare.com. Do NOT call the Museum or the Parting Glass. Watch this blog for more announcements of Hoofcare@Saratoga events or call the Hoofcare and Lameness office: 978 281 3222. The office will be closed Monday through Wednesday during the Saratoga event series. Kevin Fahey was excited when Chris Pollitt's book came out in 1995. He grabbed the first copy from me and turned right to the heart bar shoe section. He probably never read anything else in the book. He was focused. "We lost Kevin". That's what Danny Ward's message on my voice mail said. How could you lose Kevin Fahey, I wondered? You always knew when Kevin was around. Did he hike up a mountain? Did he get caught in a spiraling tangle of interstate interchanges somewhere or...did we "lose" him, in the most dreaded sort of a way? It turns out the last one is what happened. Kevin Fahey, a.k.a. "Kev the Farrier", has died. You probably don't think you know Kevin Fahey, and you'd be just like the rest of us, because he was a hard person to get to know. In a nutshell, he was a Boston-born Irishman with a distinguished background as a United States Marine. He tended to lock into ideas and people with an intensity that scared some people away. He left Boston one day to attend horseshoeing school at Donald Jones's North Carolina School of Horseshoeing...and he stayed in North Carolina for decades. But he never lost his Boston accent. That was how he talked and he was always going to talk that way. 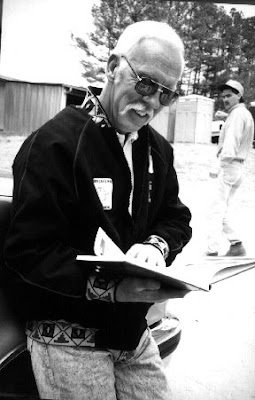 Kevin showed up 31 years ago to help Danny Ward host his first big farrier event at his school in Martinsville, Virginia, and he came back 31 more times, making him the only person besides Danny to attend every event...and helping Danny grow the event into what people call "Woodstock for Farriers". It's the most fun time you can have, and Kevin helped make it that way. 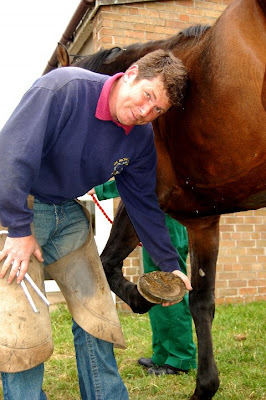 When Kevin met laminitis expert farrier Burney Chapman in the 1980s, he locked into the heartbar shoe theory and the fact that, using it, he could help a lot of horses with laminitis. So that became his specialty. He only wanted to work on foundered horses. If you had a sound horse, you didn't need Kev. He also locked into a long, loyal friendship with Burney, and helped him when he was dying of brain cancer. At some point, Kevin learned to make jewelry and he must have made hundreds and hundreds of horseshoe belt buckles in his spare time. He told me once that he would start out making other shoes, but somehow most of them turned into heart bars. Kevin was a longtime veteran of Dr Ric Redden's Bluegrass Laminitis Symposiums, where he would sell his heart bar jewelry in the trade show and intensely study the disease that fascinated him so much. Kevin had beaten cancer a few years ago, or so we all thought. But when it came back, and he was told that he only had a few months to live, Kevin did a very "Kevin" thing. And it would be the last Kevin thing he would do: He got behind the wheel of a camper, sick as he was, and he drove across the United States from his home in Colorado. He made a beeline for Martinsville, Virginia, the place he had gone back to time and time again in his life: to Danny Ward's horseshoeing school. My guess is that he didn't stop much along the way and he didn't look left or right. And Kevin Fahey didn't need a GPS. Kevin made it to Danny's, but without much time to spare. If you walk around a horse show or a racetrack or a farrier event and you see someone with a shiny horseshoe belt buckle, chances are you're looking right at Kevin. Especially if it's a heart bar. Whenever you see him, say hello for me. Do you have a favorite memory of Kevin? Are you wearing one of his belt buckles right now? Hit the comments button and leave a note to him and to his friends, or email it to fran@hoofcare.com and I'll make sure it is posted here. Here's the web cam from our building, looking out over the docks. It updates every few minutes, so you can see what's going on here. The harbor has been very quiet this summer, as many of the pleasure boaters stay dockside rather than make too many trips to the gas dock. But you will see the working boats on the water. And if you visit the blog at night...you'll see a dark square. 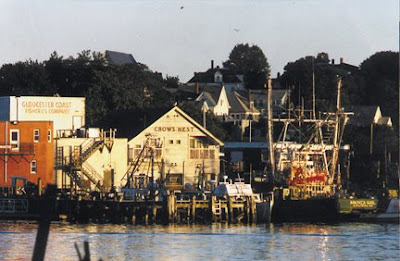 Hoofcare Publishing's office is on a tumbledown old dock in the tumbledown old fishing port of Gloucester, Massachusetts, about 28 miles northeast of Boston. We like being tumbledown, for the most part, around here. If this place ever gets fixed up, we'd have to find a new office. If you ever come to visit by sea, this is the Hoofcare neighborhoof; the office is in the reddish building on the left. Via press release from the Society for Experimental Biology. This research was presented today at the Society for Experimental Biology's Annual Meeting at Marseille, France. A team of scientists from Wageningen University, led by Professor Johan van Leeuwen, has carried out studies both into the benefits of a method of equine rehabilitation. By using computer modeling and specialist horseshoes to measure acceleration, these investigations suggest that aqua-training rehabilitation is beneficial to horses due to lower impact accelerations. Rehabilitation after equine joint and muscle injuries, including those of the back, shoulders and legs, now often involves 'aquatraining', whereby horses move in water-filled treadmills. Depending on the condition of the horse, different workloads can be obtained by regulating water level and walking velocity. Due to buoyancy, this treatment is currently thought to reduce weight-bearing forces, which can otherwise have detrimental effects on joints, but to date there has been a virtual absence of studies into the magnitude of these benefits. Professor van Leeuwen's team has used special horseshoes to measure accelerations of horses undergoing aquatraining, as well as walking normally, which provide a good indication of the impact forces involved. "Our results, based on data from seven horses, show the accelerations are significantly lower during 'aquatic walking'," he asserts. "We will be carrying out further experiments to confirm these results, but at this stage, it appears that aquatraining may indeed be beneficial for rehabilitation after joint injury." This work involved collaboration with the Department of Equine Sciences at Utrecht University, the Mary Anne McPhail Equine Performance Center at Michigan State University and the Dutch Equestrian Centre. Here's a short video clip of a horse on an aqua treadmill. There are several units such as this one on the market, showing this video is not meant as an endorsement, nor do I know what manufacturer's treadmill was used in the Dutch study. We were all betting on a kilt. Did the winner wear one? It's sort of hard to tell! Paul Robinson from Northern Ireland is standing in front of about 20,000 cheering people right now in the rodeo arena at the Calgary Stampede, where he earned the title of 2008 World Champion after five days of fierce competition. It's a little confusing, from this distance, because I know that Paul Robinson was on the Irish team at Stoneleigh last year, but Calgary has his residence listed as AYR, for Ayrshire, which is, of course, in Scotland. David Varini of Scotland was in second place, and hooray! for oldtimers, Grant Moon, representing Wales, was third! Perhaps the biggest news is that five out of the top ten finishers were from the United States: (5) Jim Quick; (7) Bill Poor; (8) Chris Madrid; (9) Jake Engler; and (10) Troy Price. If Paul Robinson really has switched over to the Scots, then Grant Moon was the only farrier in the Top Ten not from Scotland or the USA. You have to go all the way to 15th place, where you'll find Ireland's Paul Duddy, to find someone not from Scotland or the USA besides Grant. Click here to see a photo of Paul with his $10,000 check for winning. Click here to go through a gallery of many pages of photos from the competition. Just click on any thumbnail image to see a bigger view, but these are low-resolution proofs and not as sharp as you might like to see. Congratulations to Paul! I bet the Guinness or perhaps the single-malt, depending on which country Paul Robinson is from this week, is flowing in Calgary tonight! 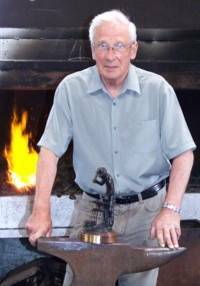 Former World Champion David Wilson of Balmullo, Scotland has been the judge of the 2008 World Championship Blacksmiths Competition at the Calgary Stampede this week. David, who is 71, was invited to judge for the fourth time in his career; no other farrier has judged the prestigious Calgary event so many times. He was the World Champion in 1985; I remember him on the stage in front of the entire rodeo audience receiving his award...dressed in a beautiful kilt. The bronze sitting on David's anvil in the photo is the coveted trophy he won as World Champion at the Calgary Stampede. According to an article in a Scottish newspaper last week, David has won 13 gold medals for draft horse shoemaking at the Royal Highland Show and has been show champion eight times, also receiving a special honor in 2005 to mark his 50th Highland Show. 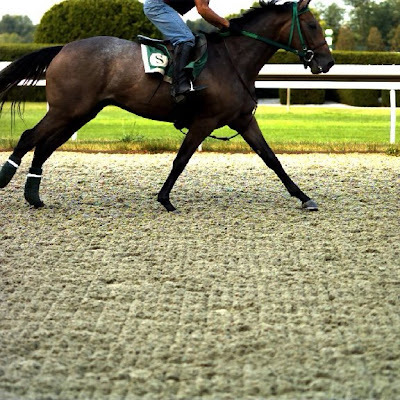 He also won the North American Challenge Cup Futurity in 1988. In 1983 Queen Elizabeth presented David with the British Empire Medal for services to farriery. Word is that entries from Scotland were especially high this year, so there may be an entire flock of kilts on the stage tonight when the awards are presented. Click here to read more about David Wilson, who will celebrate the 50th anniversary of his marriage to Mari this summer. One person that David was judging in Calgary is Ben Yeager, who lives near Victoria, British Columbia. Ben is the current Canadian champion and was scheduled to compete in Calgary along with three teammates from the Vancouver area. They will also compete in the international team competition in England later in the summer. I don't know for certain who the winner was tonight. I do know that former World Champion Grant Moon did come out of retirement and competed at Calgary this week. It's Sunday, it's hot, but for a few minutes, all my cares melted away while I watched this tiny bit of film. One of my all-time favorite videos, "7Tonnes2", is posted here for you, courtesy of the magic of YouTube. Just click on the "play" icon (horizontal triangle) and you'll be as hypnotized as I was! Kudos to creator/animator Nicolas Deveaux and Cube, the special effects studio in Paris who created this. Feel free to believe that this is real. I do!